Through a lovely invitation from a friend (thanks Debbie) I recently attended a performance of The Collegiate Chorale, at Avery Fisher Hall, Lincoln Center. I have attended the Chorale’s performances before, the most recent being a frivolous romp with Monty Pythoner Eric Idle in “Not the Messiah (He’s a Very Naughty Boy).” I was in no way prepared for my visceral, emotional reaction to Monday night’s performance – it was both uplifting and heartbreaking. The musical selection was Verdi’s Requiem which in itself is an exquisite masterpiece speaking of mortality, judgment, salvation and redemption. It’s roots can be traced back to a collaborative Requiem that Verdi and a number of other musicians had composed in honor of the passing of an operatic virtuoso Giocchino Rossini. Due to the politics of the time, that piece was never performed, but Verdi took a section of it and produced a new Requiem in 1873 as tribute to a friend and famous poet and novelist, Alessandro Manzoni, who after discovering his own son’s sudden death, died immediately. Verdi’s work is a marvel, with cacophonous undulations wailing fire and brimstone vying with the soaring, sweet angelic notes praying for eternal rest and peace for the departed. However, the true magnitude of the Requiem’s power was still to come. 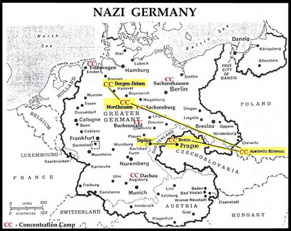 During World War II, Hitler and his henchman enacted his vision of mass ethnic cleansing by rounding up over six million Jews, gypsies and other unwanted non-Aryans who were cattlecared into death camps. There were extermination camps such as Auschwitz, Treblinka and Majdanek where many were sent immediately to the gas chambers and crematoriums. In concentration camps like Dachau and Bergen-Belsen death was also carried out through a torturous combination of starvation, disease, exhaustion, and physical brutality. And then there was the Czechoslovakia camp of Terezin on the outskirts of Prague. Raphael Schächter was a Romanian, schooled in Prague, where in addition to honing his skills as a pianist he also studied the musical arts of composition and conducting. Schächter was sent to Terezin in November of 1941 and immediately began to rally the other prisoners by organizing oral and instrumental activities. Through these exercises, prisoners were able to escape the horrors of life in the concentration camp and let their souls soar and thrive in the music. 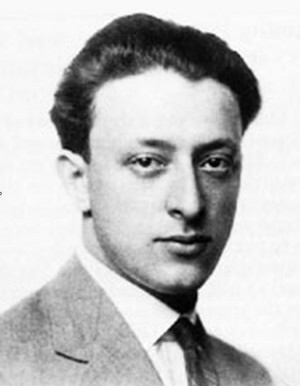 Schächter worked tirelessly, refusing to allow the constant deportation of his singers to death camps to stop his work that brought spiritual relief to his fellow inmates, so as new prisoners were brought in Terezin, he enticed new members to join the choir. Through means I cannot fathom, they managed to smuggle musical scores and even a single piano into Terezin. The SS no doubt turned a blind eye to these dealings as at the moment it served their evil long-range purpose. as David prophesied with the Sibyl. 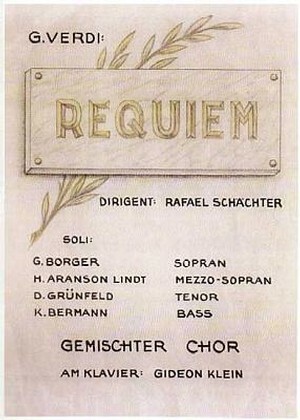 Sadly, after the first performance of the Requiem, almost the entire cast was deported to Auschwitz. This action was repeated over and over again, and in 1944 a further indignity was added, as the Nazis decided to use the Requiem performance in a propaganda film. The SS went to great extremes on this, bringing in food, toys, playground equipment, new clothes and other items to enhance the illusion that Terezin was a spa-like environment where Jews could relax and enjoy themselves.. Also, they invited the Red Cross to visit to see this camp for themselves. Somehow the Nazi ruse worked, for the Red Cross representatives reported that the Jews of Terezin had a decent environment and were being treated well, given wartime conditions. Once the Red Cross visit was concluded, all the “extras” of the camp disappeared. After this final performance of the Requiem Schächter was deported to Auschwitz with his fellow Terezin performers. He died on the death march to the camp in January 1945. 97,297 Jews who were brought to Terezin died – 15,000 of them were children. In April 2005, in honor of Raphael Schächter and the Jews of Terezin, the conductor Murray Sidlin conceived, wrote and conducted “Defiant Requiem: Verdi at Terezin,” and this was what we witnessed at Avery Fisher Hall. In addition to the music, film of a few Terezin camp survivors speaking of their remembrances of Schächter and the camp was displayed and on stage performers such as Bebe Neuwirth also read passages about this journey. A survivor’s two sons and grandson also performed. At the close, the choir and the orchestra slowly walked off the stage, and down the aisles, somberly singing the last refrain. At the end, a train whistle blared out, mimicking the sound that the Jews heard as they left in the cattle cars to their doom. Please watch this trailer for the feature documentary, “DEFIANT REQUIEM,” about this cultural resistance at the Nazi concentration camp, Terezin, where the inmates fought back…with art and music. This entry was tagged AUSCHWITZ, AVERY FISHER HALL, CHOIR, COMPOSING, CONCENTRATION CAMPS, CZECH, DEATH CAMPS, Defiant Requiem: Verdi at Terezin, HITLER, LINCOLN CENTER, MUSIC, NAZI, ORCHESTRA, ORCHESTRA OF TEREZIN REMEMBRANCE, RAFAEL SCHACHTER, SURVIVORS, TEREZIN, VERDI REQUIEM. Bookmark the permalink.